Have you ever been teaching a kids' class at church and you couldn't seem to keep the kids engaged with the lesson? They simply wouldn't sit still and listen as you tried to share the lesson. The kids you are trying to engage with your lesson are growing up in a culture that has very little room for sitting still and listening to someone talk for more than a few minutes. Today's kids are growing up in a culture that celebrates interactive engagement. Why? Because that is the way kids are naturally wired. The old method of "sit still and listen while I scatter knowledge your way" is no longer effective (I would argue that it's never been effective). Rather than sitting passively while listening to a lesson or even watching a video, today's kids want to help create and personalize their learning experience. 76% of children have access to or own a tablet. This is up from 64% last year. 94% are actively doing other things while watching TV. 32% of children say they are using their cell phone and 24% are using a tablet. 41% of four-to six-year-olds own a tablet, and on average, they’ll own a mobile phone by the age of 11. Game consoles like Xbox and Playstation are on a downward trajectory. In the last year, console use has declined by 9%. Many attribute this to mobile gaming and apps. But several television networks are using this trend to help boost viewership. They are integrating social media, apps and websites to boost interactivity during their shows. An example is America's Got Talent. Viewers can cast their vote and help determine the winner. Another example is Netflix teaming up with Mojang to release Minecraft: Story Mode. It will be an interactive series that lets kids choose how the story unfolds. Many are saying this is the future of programming for kids. Another one of the hottest games currently is Fortnight Battle Royale. The game uses a lot of combat and building skills. It is currently the most popular console game for children under the age of 18. It is most popular with 11-year-old boys. And it is extremely interactive. Producers and entertainment experts know that it's more important than ever to engage children in the experiences offered. They are constantly looking for ways expand and deep engagement. So back to the dilemma many children's ministries are facing with kids not "listening." Lack of interactive engagement is one of the biggest culprits of this. Take a look at your lesson. How much of your time is being spent "lecturing" the kids versus providing the kids with interactive learning experiences? The more you lecture, the less kids learn. The more you involve kids in the learning experience, the more they will learn and retain. This weekend, try making your lesson more interactive. If you're sharing the story of Jesus walking on the water toward the disciples, have kids act it out while you're sharing it. They can make the sounds of a storm. You can spray a water mist at them to represent the rain. You can have a fan blowing water their way to represent the winds of the storms. You can turn a table upside down and make it the boat the disciples were in. You can have kids slap their knees to make the sound of waves. You can then follow this with a debrief in groups with 3-4 discussion questions. It's during this time you can help kids apply the lesson to their life. Do this and I promise you will keep kids engaged in the lesson. Sit down with the lesson and see how much is engaging kids in active learning. If you want to see kids engaged in the lesson, then you've got to make the majority of your lesson interactive. Does this mean your lesson will be noisy? Yes. But noisy is a sign of engagement. Does this mean kids will have the opportunity to choose how they are going to learn? Yes. And when kids are allowed to choose their learning method, they will engage. Does this mean you will feel like you are losing control of the class? Yes. And when you place partial control of the class into their hands, they will respond. Take a close look at the curriculum you are using. How much of it is interactive vs. how much is lecture based? If you have the right curriculum, it will skew heavily toward interactive learning. If you want to use a curriculum that immerses kids in the lesson through interactive activities, videos, discussions, crafts and more, then check out the curriculum series at this link. It is highly interactive has been proven to engage kids in a great way. 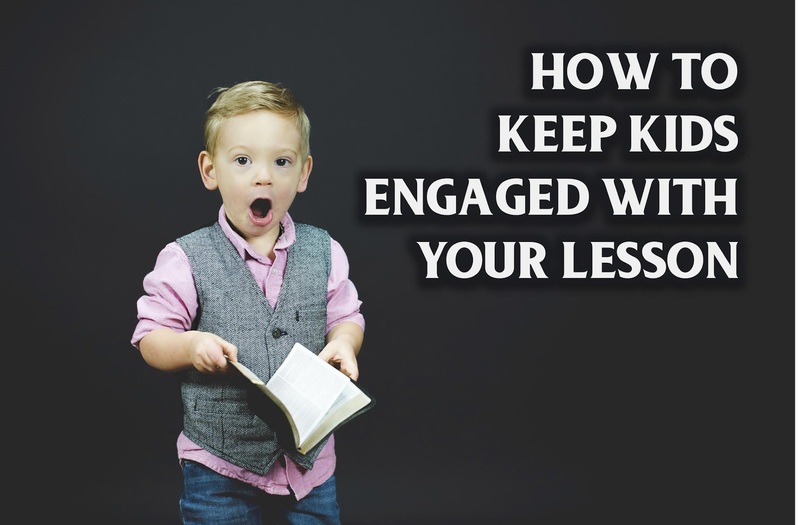 And if you're about ready to lose it, because the kids won't listen to you, then it's time to teach with a method that has you listening to the kids as they learn through interactive engagement.